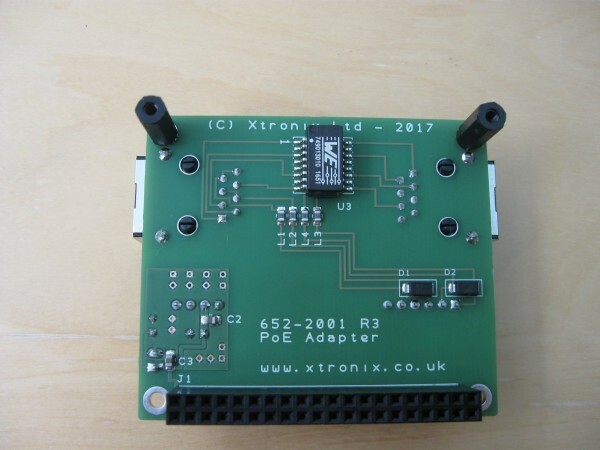 The Xtronix ‘Power Over Ethernet’ (PoE) adapter is designed to be plugged directly on to a Raspberry Pi printed circuit board and to supply +5 Volts to the Raspberry Pi. The adapter fully conforms to the IEEE 802.3af Power over Ethernet standard. It is intended to be powered by an IEEE 802.3af compatible Injector where power is supplied over the Ethernet Cable. A 2 pin connector allow supplies +5 Volts to user equipment and a 40 Way connector allows the user to connect to the Raspberry Pi GPIO connector. Plastic pillars and screws allow the PCB to be fixed to the Pi B+, Pi 2B or Pi 3B PCB. 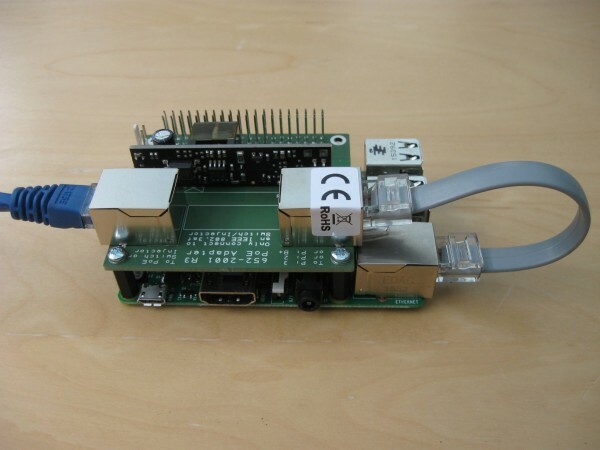 The GPIO connector and the adapter PCB (CONN2) allows the user to connect to the Raspberry Pi PCB GPIO. The pin out of this connector is the same as the Raspberry Pi PCB GPIO connector P1. It is a 40 way connector. The 2 way connector on the adapter PCB allows the user to plug in a power supply lead to power external equipment fron the +5 volts on the PoE adapter. A suitable mating connector is a Molex KK series (0.1”) shell and crimps. The PCB is also available mounted in a translucent red plastic box that can house the Raspberry Pi PCB with the Xtronix PoE Adapter PCB mounted. The box is in two parts, the base into which the Raspberry Pi PCB together with the PoE PCB is clipped into and a lid that fits on top of the base protecting the boards from damage. The box has apertures that allow the various Ethernet, USB, HDMI and Audio cables to be brought out of the box. The box also extends around the memory card protecting it from damage. Distributors Xtronix Ltd only sells this product via the eBay listing, we do not have any distributors from which this product can be purchased.